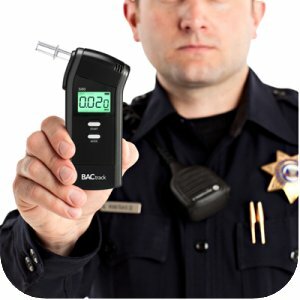 Home » Posts Tagged "dui checkpoints"
How To Beat A Breathalyzer Machine – The most commonly asked question on my website, and probably the internet when it comes to Driving Under the Influence charges, is, without a doubt, “How do I beat the Breathalyzer machine? However, let’s explore some additional options. First, let’s analyze what methods DO NOT work. Eating your own underwear – Why? Is the first question that comes to mind. Why would anyone in their right mind try such a ridiculous method? Well, for the man who tried it, this was’t such a bad idea. Presumably, he was hoping that the cotton would absorb the alcohol in his stomach thus lowering his BAC result. You can’t make this up, folks. Unfortunately for him, by the time he got to the station, not only did the cotton in his stomach did not do anything for the alcohol that was already in his blood, he looked ridiculous because of the hole in his pants. The Breathalyzer test gathers deep lung, or alveolar, air. So, after a few hours of drinking, followed by a few minutes of eating cotton will not do you any good. Thanks for playing. UPDATE: Eating toilet paper – This is a new one, folks! One man tried to eat toilet paper in the hopes of cheating the breathalyzer machine. Unfortunately, as is stated in number (1) above, the machine is designed to test alveolar air, and therefore his attempt to cover the alcohol with toilet paper would not work; it may just mask the smell or at least absorb any mouth alcohol. Nice try, but you fail. UPDATE #2: Eating your own shirt – Here is another doozy, friends.. One woman tried to eat her own shirt in order to avoid a DUI after she attempted to run away from the police and passively resist arrest. When the breathalyzer technician instructed her not to put anything in her mouth, as he is probably required by state law and after she agreed to take the breathalyzer test, the woman”stuffed a large portion of her shirt into her mouth and began chewing at the fabric.” Although it would not have much of an effect on her breathalyzer result, more than likely it did earn her a ‘refusal’ mark on the breathalyzer due to her once more ‘passive’ resistance, and secured a lack of an Intoxilyzer number for the State. So, can we call that kind of a win? Eating your own feces – O.K., first off, disgusting. I can’t even. But, a man in March, 2005 tried it. And failed. Not only did he fail, but he will now forever be remembered as the man who ate his own feces. Good luck to you, buddy. Eating smelly foods to overpower the alcohol scent – While it may not be such a bad idea to throw the cop’s scent off the booze trail, it is completely and utterly useless for a Breathalyzer machine. The inner sample chamber is mechanically calibrated to detect any presence of ethanol (along with some other substances depending on the amount of filters installed, etc., which could artificially inflate your BAC result). The device is so sensitive, in fact, that it has a “mouth alcohol” detector, so if you have alcohol present in your mouth, the machine should return an error. The fact that these detectors never work is besides the point, but they’re there. So, fail. Drinking Zima instead of “real” drinks – Seriously? Well, apparently so. Some teenagers believed that could do the trick. I guess under the erroneous belief that there are different “kinds” of alcohol since Zima doesn’t make your breath smell as bad. Alcohol is alcohol, no matter what it tastes or smells like. You are the weakest link, goodbye. Sucking on a penny – The idea behind this popular myth is that the copper in the penny will neutralize the alcohol. Well, similar to (5) above, the alcohol is not coming from your mouth. I am not sure about the reaction that occurs when alcohol meets copper, but I can tell you the penny won’t protect you from the alcohol in your lungs. Furthermore, according to at least one source, pennies are no longer made of copper. It is now 97.5 percent zinc and 2.5 percent copper. So even if copper would have been helpful, its negligible quantity in the penny would require a plethora of them — you can bet the officers will notice your scheme and quickly stop it. Using Listerine or some other mouthwash – Worst. Idea. Ever. Why? Because nearly all mouth washes contain, what? That’s right — Alcohol! So you are combating the presence of alcohol in your body — with more alcohol! What if your result would have been less than 0.08, initially? 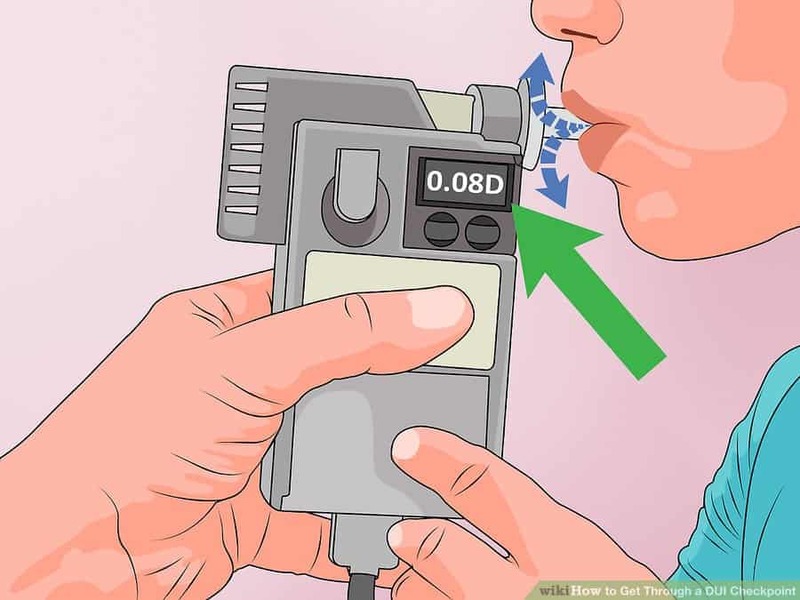 Well, you’ve just secured a certain trip to the jailhouse because you will most likely blow way above 0.08 due to all the fresh alcohol in your mouth. Mouth alcohol detectors rarely, if ever, work. Explaining it to the cop won’t do you any good. Nice try. Chewing gum – Now here is a good trick to throw off the cop (if you can hold your liquor). May be he’ll let you go if he can’t smell alcohol and you look fine to him. However, again, like numbers (5) and (8), above, the gum does not alter the workings of the inner chamber inside the breathalyzer machine. Depending on the gum, it may end up “helping” you as much as a mouth wash, due to their containing alcohol. Inhaling instead of blowing – Nope. The machine has pressure detectors in place to detect if air is being blown in. You will succeed in making the officer angry, though. Not sure if that is what you want..
Burping, belching, or regurgitating – This will bring up alcohol from your stomach content into your mouth, which will in turn elevate your BAC levels. Sorry, try again. Eating peanut butter – This one is at the bottom of the list because it is the closest thing to something that could work (if you could wash your lungs with it). It is true that the high levels of sodium, which can be found in peanut butter, will neutralize ethanol by creating two byproducts – sodium ethoxide (also known as alkoxide) and hydrogen gas. But, again, the problem is that the peanut butter travels from the mouth into your stomach, completely bypassing the lungs — where the alveolar air, which is full of alcohol, is about to come from and be tested by the machine. This would be a great trick to eliminate mouth alcohol. Also, good luck getting your hands on some peanut butter at the police station — or getting it in your mouth with your hands handcuffed behind your back. I don’t think this method is in your cards. Again, the best way is to not drink and drive – Speaks for itself. The second best way is to refuse the breathalyzer test – Again, easy. You hand over your license to the nice police officer for failing to comply with the state’s implied consent laws and politely thank him as you are escorted to your “comfortable and clean” jail cell, where you will be spending the next few hours. 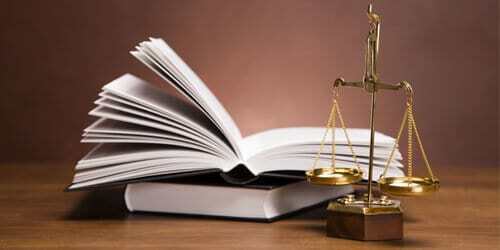 You make your lawyer’s case a lot easier, the possibility of a jury trial much more of a reality, and your chances of beating your DUI case increase exponentially (with the right lawyer who can attack the officer’s procedures and training the stand.) So, refuse the tests, if you can afford to lose your license. Special Note: Do not attempt this method if you are own a Commercial Driver’s License or a Pilot’s License, as the resulting hardship may be tougher on you and your career than simply fighting the uphill battle of a per se DUI case. Blowing just the necessary length of time and stopping – If you are truly in a pickle and think you did not have that much to drink, and you are afraid to lose your license, and you believe that enough time has elapsed, although this goes against every rule in the book — blow just enough to where the machine registers the fact that you’ve blown, and not a millisecond longer (good luck with that timing). Well, why is that? The officer is interested in you blowing as long as possible. That will ensure an artificially elevated result, even if you’re under the limit (how else can you explain the plethora of DUIs where the person legitimately drank 1-2 beers and blows a 0.12.) The longer you blow, the more alcohol enters the sample chamber of the machine, and the more molecules of ethanol are captured by the Intoxilyzer 5000EN’s detector via the process of infrared absorption. If you blow just the right amount of time, you can at least keep the number low and more in line with what you should be registering (in theory — as these machines have a lot of other problems). You’ll of course have to learn what sounds the machine makes when a sufficient sample is provided, as the officer will want you to continue to blow. Again, this method, although possible to at least keep you in the right range, is laden with difficulties. I DO NOT recommend it. Hyperventilating or exercising – This could work, but the problem is that you won’t be able to breathe out all of the alcohol — that would be ridiculous. It’s in your system, in your blood stream, in your lungs, and possibly still in your mouth. The most you could do is lower your breath test result by 10-20%, so if you’re close to the limit, you may be able to blow under it. If you’re stone cold drunk it won’t do more than simply make you dizzy, which could lead to you throwing up — never a good idea… Especially with an officer present — who is suspecting you have been operating under the influence! Good job, you just helped make his case for him. Also, good luck hyperventilating or exercising with the officer around. Surely he won’t notice..
Burping, belching, or regurgitating (yes I realize its on the list of things that don’t work) – Here’s the thing, the breathalyzer operator is supposed to have you under continuous observation for 15 – 20 minutes (depending on the state law). If you make an audible burp, belch, or regurgitate stomach contents periodically, the breathalyzer technician, assuming he conforms to the breathalyzer operator’s manual , must reset the 20 minute observation period — because you brought back alcohol in your stomach into your mouth. Gross, but possibly effective. The problems are that (a) s/he may not care and tell you to take the test anyway (which could be a great defense in court, especially if there is a video recording), but again, you’ve accomplished nothing at beating the test; (b) you run the risk that some of the puke or belch substances will remain in your mouth and elevate the result even after an additional 20 minutes; and (c) if you’re still digesting previous alcohol, your BAC is on the rise — more time elapsed = higher BAC. You’re just digging your grave even further and where your result may have been lower (albeit still above 0.08), you may end up with an aggravator if you blow a 0.15 or above . Rinsing out your lungs – This is, of course, a joke. It’s the dumbest thing you can possibly think of doing (and, believe it or not, it has been tried). This is a sure way to drown yourself. DO NOT DO THIS. There really is no “scientific” or foolproof method of going from a result above 0.08 to one below it. The best way to avoid a DUI is to not drink and drive. However, if you are charged with a DUI, you need experienced and knowledgeable SR22 Insurance Broker to help you. Please, contact us or call me at 855-GET-SELECT (855-438-7353). Getting Through A DUI Checkpoint – In some states, police set up roadblocks and stop drivers to search for signs of intoxication. If the officers have reasonable suspicion that you are driving under the influence, they will ask you to pull over to investigate further. Generally, your encounter will last less than a minute, during which the officer may ask to see your driver’s license and registration. They will also probably ask if you have been drinking. If you are pulled over for further questioning, you can protect your rights by remaining silent and declining a field sobriety test. Avoid the checkpoint if possible. You aren’t legally required to go through a checkpoint if you see one up ahead. Instead, you can pull onto a side road or do a U-turn, if legal. Don’t break the law to avoid the checkpoint. For example, you must use proper turn signals, drive at a safe speed, and observe all other traffic laws. If you don’t, then the police have a reason to pull you over. And once you are pulled over, they can give you a chemical test if they suspect you have had too much to drink. The police will scrutinize any vehicles that evade the checkpoint, so make sure to drive properly. Slow down as you approach the checkpoint. 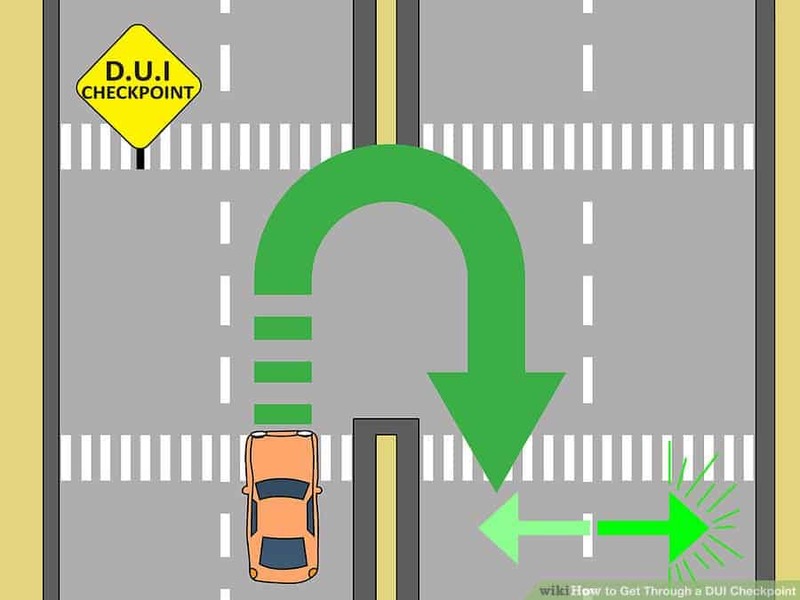 Once you see the checkpoint up ahead, you should slow your vehicle. You cannot speed through the checkpoint, which will give the police reason to chase you down and pull you over. Many police now disguise checkpoints as construction zones. For example, they will put up orange cones and construction signs. This is done to prevent you from avoiding the checkpoint. In some states, police must advertise where they will set up checkpoints. For example, they may publish a notice in the newspaper. You can also download apps, such as PhantomAlert, that will alert you of DUI checkpoints. Guess how much you’ve been drinking. 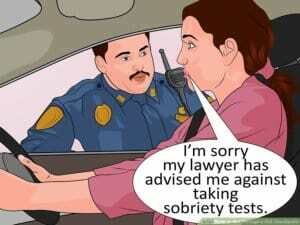 If you haven’t been drinking alcohol, you have nothing to fear from a DUI checkpoint. However, you might have been drinking. If so, be aware the police can ask you to pull over, where they will administer a field sobriety test or a breath test. The legal blood alcohol concentration (BAC) in all 50 states is 0.080. Generally, a 160-pound person will have a BAC of 0.080 after four drinks. A drink is 1.5 ounces of hard liquor, 5 ounces of wine, or 12 ounces of beer. By contrast, a 120-pound person will have a BAC of 0.081 after consuming three drinks. Other factors influence your BAC, such as whether you had the drinks with a meal and when you drank them. Roll down your window. 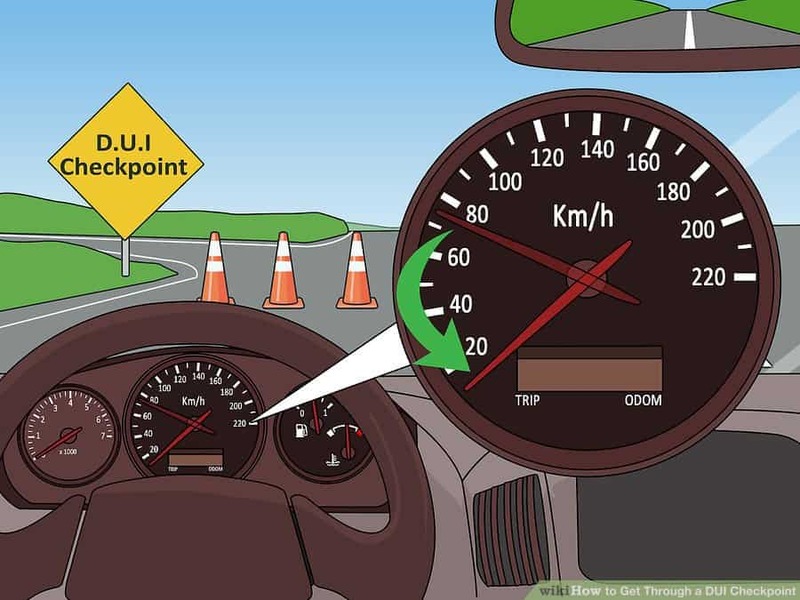 You should cooperate during the DUI checkpoint. This means coming to a complete stop and rolling down your window. If you don’t, then the officer’s suspicion might increase that you are hiding criminal activity. 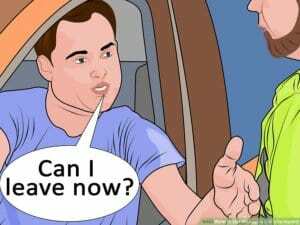 The officer will want to bend down close to your window so that they can take a peek inside and also smell your breath. If you are transporting anything you don’t want the cops to see, it should be stowed under your seats. You can try to mask alcohol on your breath with a breath mint. However, alcohol is in your lungs after you drink, and the “alcohol breath” you smell comes up from your lungs when you breathe. A mint might mask some of the smell but only briefly. Hand over your license. You must show that you are legally allowed to drive in your state, so you will need to hand over your driver’s license and registration. You should have them handy so that you aren’t fumbling to find them. A cop might interpret fumbling as lack of coordination due to alcohol consumption. Make sure you have your registration and license nearby so you can easily hand them over. You may also have to turn over proof of insurance, so have it nearby as well. If you have been drinking, you probably are best of saying simply, “I don’t want to answer that.” Remember not to argue or be rude. When answering, look away from the officer. If you talk, the officer will try to get a good sniff of your breath. 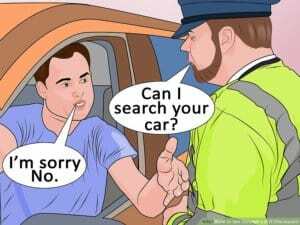 If they detect alcohol, then they will ask you to pull over for further questioning. Avoid saying, “I only had one drink” or “I stopped drinking several hours ago.” Any admission of drinking could be used against you. The officer also might stick their head into your car or point a flashlight into it and wave it around. They are not supposed to enter your vehicle at the checkpoint. Politely ask them not to invade your space or wave a flashlight around. Drive away when given permission. If nothing goes wrong, you should be sent on your way in less than a minute. The average checkpoint stop lasts about as long as a red light at an intersection. Observe all traffic rules as you pull away. Don’t speed or make sudden movements. Use your blinker. Pull over, if requested. When you go through the checkpoint, the police can ask you to pull over if they have a reasonable suspicion of criminal activity (such as drunk driving). As a rule, they cannot ask you to pull over unless they have this suspicion. From the moment the police ask you to pull over, you must understand the police are in control of the situation. You should generally comply with their requests—unless you have a valid reason not to. Try to remain calm throughout the encounter. The more nervous you are, the more suspicious you will look. Take a couple of deep breaths as you pull your car over. Choose whether to take the field sobriety tests. These tests usually involve walking on a white line or balancing on one foot. In many states, you are not required to take these tests. However, the officer might arrest you if you decline. The problem with these tests is that many sober people fail them. Consider taking a chemical test. 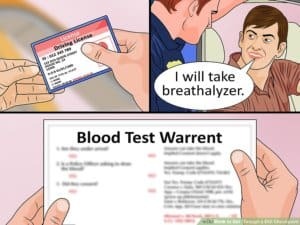 You aren’t required to take a breathalyzer or other chemical test, either. However, there may be negative consequences for declining. You should think carefully about your choice. For example, you could lose your license for a certain amount of time. Driving is a privilege, not a right. And your state can make a driver’s license conditional on your consent to chemical tests. These are called “implied consent laws.” In California, for example, you can lose your license for up to a year if you decline. You might want to decline if you already have a DUI on your record. There’s no reason to give the police more evidence to use against you. Even if you decline, the police can get a warrant for a blood test, which they can administer against your will. So refusing a chemical test might only buy you some time. Remain silent. You aren’t required to answer any questions other than to identify yourself by handing over your license. Refuse to do any kind of verbal test, such as counting backwards or reciting the alphabet backwards. You might think you can talk your way out of a ticket, but you’d be wrong. You can also clarify you won’t be answering any questions. 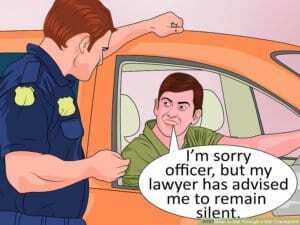 You can say, “I’m sorry, officer, but my lawyer has advised me to remain silent when pulled over.” Then stay silent. Simply smile if the officer asks another question. Ask if you can leave. The officer cannot hold you indefinitely. If your BAC comes in under the legal limit, the officer should let you go.Furthermore, the officer can only arrest you if they have probable cause that you broke the law. Asking to leave is not the same as taking it upon yourself to leave. Don’t throw the car into drive and pull away. Don’t even walk away from the officer. Instead, stand there and ask if you are free to go. 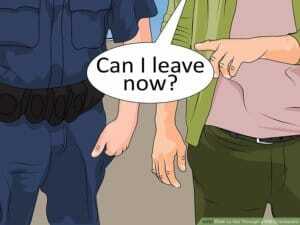 If the cop ignores your question, continue to ask it: “Can I leave now?” Always remain polite but persistent. 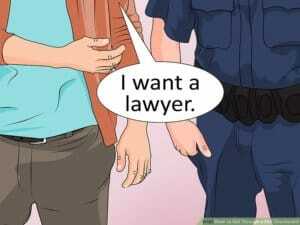 Police must stop all questioning once you request a lawyer. However, you can’t voluntarily start talking about the incident. If you do, the police can start up the questioning again. Call a lawyer. Once taken to the police station, you’ll be booked. This usually involves turning over personal belongings and having fingerprints and your picture taken. At some point, you should be given a chance to call a lawyer using a phone at the jail. 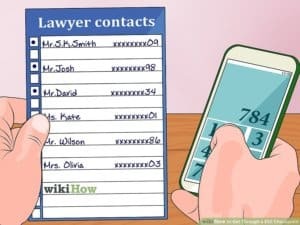 If you don’t know the name of a lawyer, then call someone who you know is home. Ask them to get an attorney and tell them where you are located. Some stations might have a list of lawyers you can look through. If you aren’t given a chance to call a lawyer, then you might be able to ask for one when taken before the judge for your initial appearance or arraignment. When you talk to your lawyer or family on the phone, admit nothing. The jailhouse phones are usually bugged. What is a court ordered FR2 in Florida ? What is a court ordered FR2 in Florida – The No-Fault Law (S. 627.733, 627.734, and 627.736(9)(a), F.S.) requires proof of Personal Injury Protection (PIP) and Property Damage Liability (PDL) coverage continuously throughout a current vehicle registration period in the following amounts: $10,000 (PIP) for personal injury protection per occurrence $10,000 (PDL) for damage of property of others per occurrence. 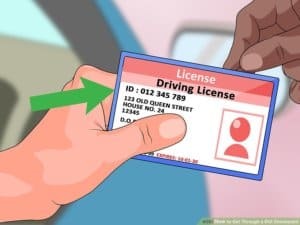 If you are cited by law enforcement for failure to show proof of no-fault coverage and the court suspends your driver license, a Financial Responsibility suspension will be applied to your driver license record. Since the court has afforded due notice and opportunity to be heard, the suspension is effective immediately. You must carry PIP coverage and PDL coverage certified by an original “non-cancellable” pink SR-22 form for two years from the original suspension date. The SR-22 must be stamped with the statement “SIX MONTHS NON-CANCELLABLE“. (The SR-22 form is purchased from an automobile insurance company and can be electronically submitted.) Copies of the SR-22 form will not be accepted, nor will insurance cards or policies in this case. (If you are within 60 days of the end of your suspension period or if you are a non-Florida resident, you may be exempt from the SR-22 requirement. Ask an associate for details.) Pay the reinstatement fee based on previous suspensions, provided no other issues are on file making your record otherwise ineligible for reinstatement. This fee is in addition to any other fees due for other suspensions cleared at the same time. Your original pink SR-22 will be scanned and subject to verification. You had PIP and PDL coverage on the offense date, present proof of PIP and PDL in effect on the offense date. The proof of insurance may be a card, policy or binder, provided it lists PIP and PDL coverage. If the insurance was already submitted and was denied, a letter on letterhead from the insurance company must be presented and must include: insurer name, policy #, policy period, vehicle(s) insured, coverage (including BIL and PDL) and covered drivers. Or, insurance for another policy/company must be presented that was in effect on the offense date. Pay the reinstatement fee of $6.25, provided no other issues are on file making your record otherwise ineligible for reinstatement. This fee is in addition to any other fees due for other suspensions cleared at the same time. Your proof of insurance will be scanned and subject to verification. If you do not want to purchase an SR-22 and you cannot prove that you were insured on the offense date, you can surrender the plate for the vehicle that was uninsured and operated at the time of the offense (subject to verification). Important Note: If you choose this option and you want to re-register the vehicle within 2 years from the date of the offense, you will be required to show an SR-22 at that time. Pay the reinstatement fee based on previous suspensions, provided no other issues are on file making your record otherwise ineligible for reinstatement. This fee is in addition to any other fees due for other suspensions cleared at the same time. If you do not want to purchase an SR-22 and you cannot prove that you were insured on the offense date, you can verbally certify that you no longer own the vehicle for which you received the citation (subject to verification). Pay the reinstatement fee based on previous suspensions, provided no other issues are on file making your record otherwise ineligible for reinstatement. This fee is in addition to any other fees due for other suspensions cleared at the same time. Your original citation will be scanned and subject to verification. If you cannot prove that you were insured on the offense date, you can verbally certify that you did not own the vehicle on the offense date for which you received the citation (subject to verification). You must provide the original citation that specifies that you failed to provide proof of insurance to the law enforcement officer (subject to verification). Pay the reinstatement fee of $6.25. If your license plate is still expired and you do not want to purchase an SR-22, you must provide the original citation that specifies that you failed to provide proof of insurance to the law enforcement officer (subject to verification). Pay the reinstatement fee based on previous suspensions, provided no other issues are on file making your record otherwise ineligible for reinstatement. This fee is in addition to any other fees due for other suspensions cleared at the same time. Provided it has been 2 years + 1 day since the original suspension date, pay the reinstatement fee of $6.25, provided no other issues are on file making your record otherwise ineligible for reinstatement. This fee is in addition to any other fees due for suspensions cleared at the same time. In rare cases, when an individual is exempt from the Florida No-Fault Law, a law enforcement officer may issue a citation in error or the court may request a suspension in error. When this occurs, our office must alert the Division of Motorist Services in Tallahassee of the error (subject to verification) and await their instruction. If the Division of Motorist Services authorizes the suspension clearance. a $6.25 reinstatement fee will be due. 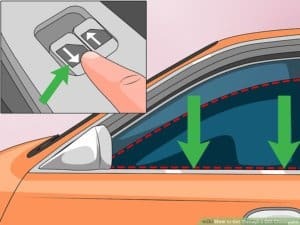 If they deny clearance, you will be required to comply with one of the options listed above in order to reinstate your driving privilege in Florida.